Boil the rice with salt and spread it on a plate. Heat ghee in a pan, add mustard seeds. When they begin to splutter, add urad dal and red chillies. Add curry leaves. Add cashew nuts. Then add coconut after cashew nuts have turned golden brown. Saute coconut on a low flame, until it turns golden. Add salt if required. Remove from flame and serve hot with pickle and papads or curd. I can somehow never resist sizzlers. Something about that sizzling noise in the monsoons along with the aroma, makes me long for sizzlers. Couldn’t believe my luck when I discovered that Cafe Mangii was hosting a Sizzlers Festival till the end of the month. I made my way to the Khar outlet, one that I have never visited before. Like all other Cafe Mangii outlets in Mumbai, it is elegance and informality personified. The relaxing ambience immediately beckons you. The sizzlers menu set my taste buds tingling. Each one sounded more exotic than the other. What’s more! 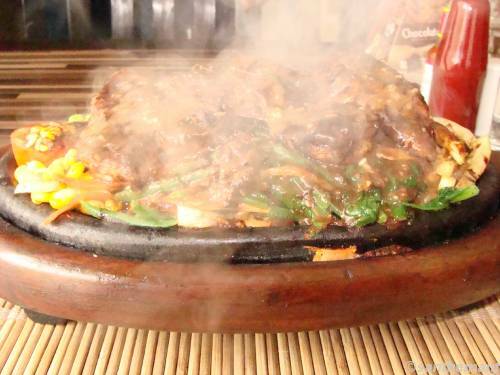 Each sizzler comes with traditional flavors and spices served with exotic veggies. I was confused. But since I have a soft corner for sea food, I opted for the Harissa marinated Rawas steak. It was a treat for the eyes too with the colourful bell peppers, cheese fondue and of course the rawas steak and herbed risotto. My colleague tried the Pot Roast Chicken with mushroom pepper sauce and assured me it was lip-smacking. The rawas was grilled to perfection and simply melt in my mouth. The cheese fondue complimented it and the veggies added the right element of crunch. There was an interesting amalgamation of flavours and textures. It was extremely filling and complete value-for money. The mushroom sauce my friend said was a total palate pleaser. Vegetarians can enjoy the perfectly grilled cottage cheese & pepper steak or dig into the corn, potato & jalapeno steak served with basil pesto sauce. Lamb Leg with rosemary and Grilled Pork Chops with traditional barbeque sauce is another hot favourite among meat lovers. We skipped the Pizookie, a feisty dessert, but dessert lovers should try it. So while it rains outside, head to a Cafe Mangii outlet near you to have that incredible sizzling experience. I mean, for your taste buds! Today is the perfect day for some hot khichdi. My ultimate comfort food anytime and more so in the rains. Khichdi, Khicuri, khichri…. it is known by many names, but they all mean the same thing – a combination of dal and rice cooked together, sometimes with vegetables. It is a complete and nutritious meal in itself. Different parts of India prepare khichdi differently, but we all love it. My favourite is the Bengali version with moong dal, potatoes, other vegetables. A dash of chilli powder, bay leaves n garam masala, added and it is unparalleled. Light and delicious. It is simple to prepare too and can be made at a short notice. Pair it with papad and pickle or begun bhaja(brinjal fry) and you are in seventh heaven. Gujaratis too make great khichdi which is eaten with their sweetish kadhi. Delectable. The Gujaratis also do a spicy version called the vaghreli khichdi. Mumbai has several restaurants which serve this khichdi. Soam in Babulnath, Mumbai makes delicious bajra khichdi. Taste plus health. I somehow don’t relish the daal khichdi offered by Udupi joints in Mumbai. there is too much of haldi in those. Another variation of khichdi which I enjoy making is palak khichdi. Add blanched palak to your regular moong dal khichdi with ginger, garlic and voila! a great meal is ready. Again, it is not neccessary to use only moong dal in khichdi. I often make it with masoor dal and even chana dal. Only the tempering should be different. Interestingly, in Mumbai we call the upvas food sabudana khichdi by the same name, even though it is not made with rice and lentils. a friend of mine makes khichdi with seven grains. It is the ultimate in taste and nutrition. Some people enjoy their khichdi with pickle, others with curd. whatever the accompaniment, I am only particular about the fact that the khichdi should not be overpowered with spices. Otherwise the purpise of having a light meal of khichdi is defeated. In fact it is often eaten when one is unwell or has an upset stomach. I can eat it anytime. Khichdi is a versatile dish and so much can be done with it. One can add interesting ingredients to it to give the basic khichdi a twist. I am all set for making khichdi tonight. Are you?